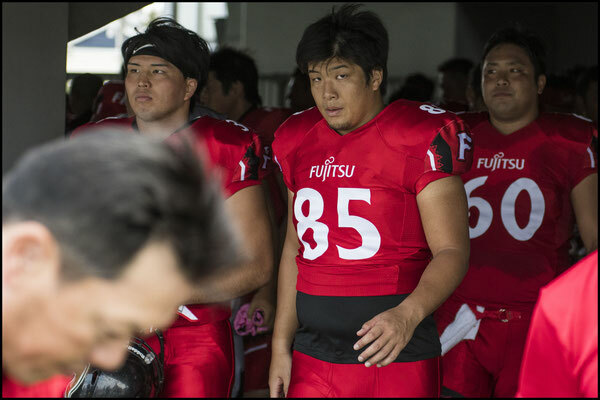 In a cooler than expected Kawasaki on Sunday, National Champions Fujitsu showed they still have one of the most balanced teams in the league. 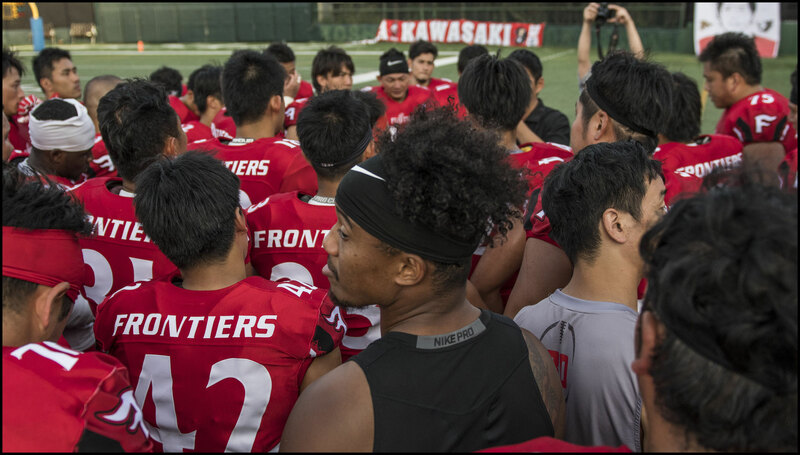 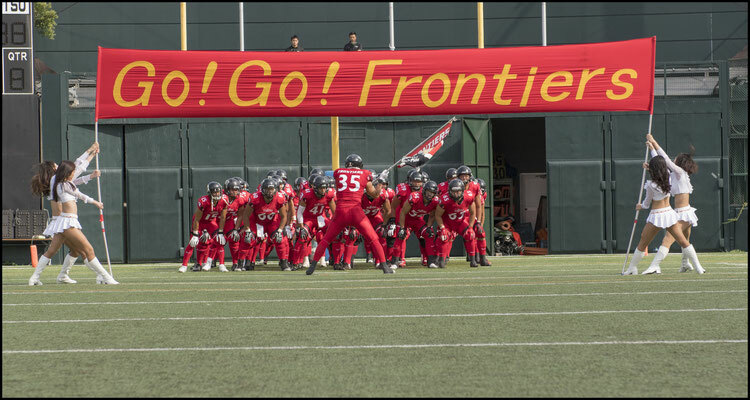 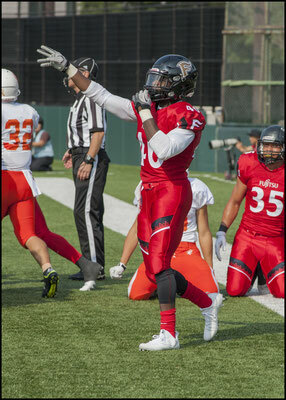 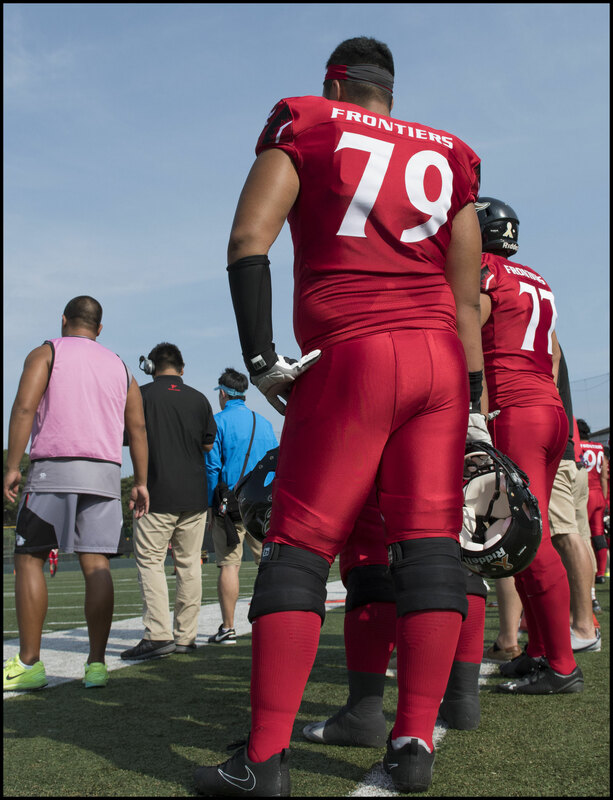 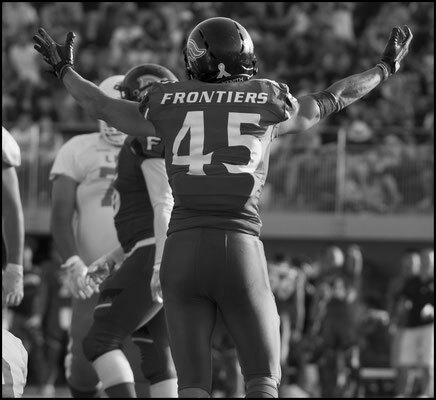 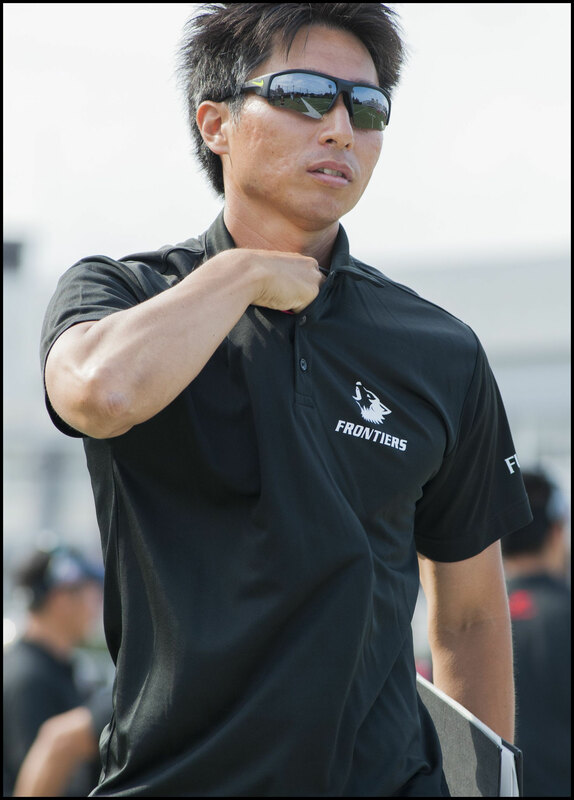 The Frontiers racked up 30 points against a Lixil Deers side that seems to be slipping further behind the top sides. 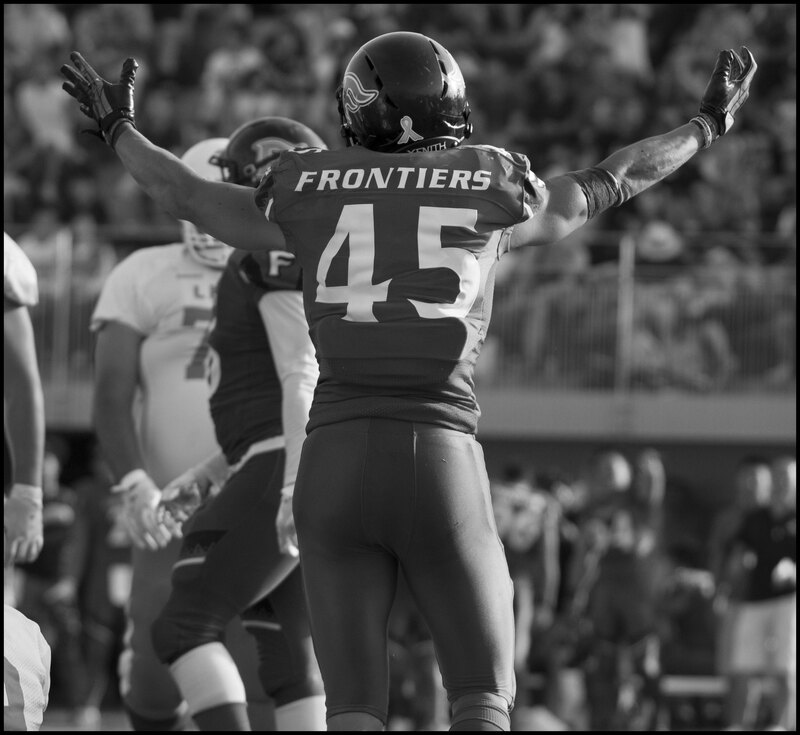 The Frontiers played a relatively straightforward game, and afterwards QB Colby Cameron remarked, “Lixil had the whole summer to prepare, and you never what they are going to throw at you, so we tried to stay basic in what we did.” Which is not to say that the Frontiers didn’t air the ball out when opportunities arose. 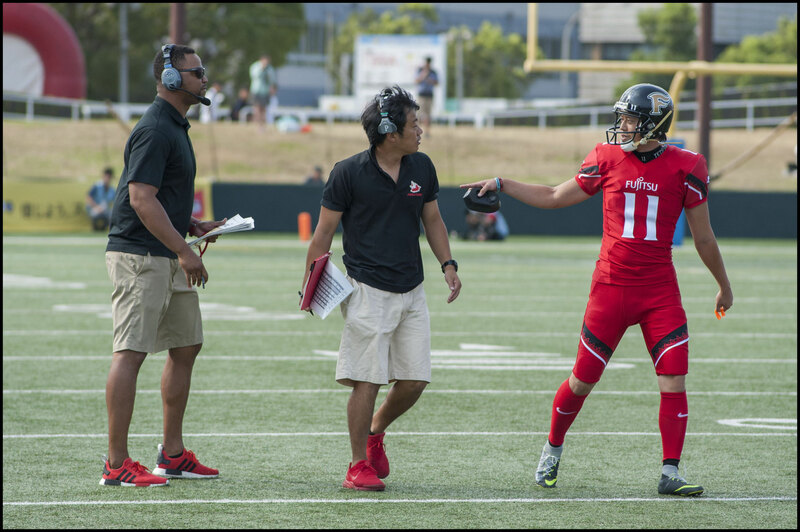 Cameron completed 15 of 21 attempts for 193 yards with the longest being 34 yards to WR Clark Nakamura. 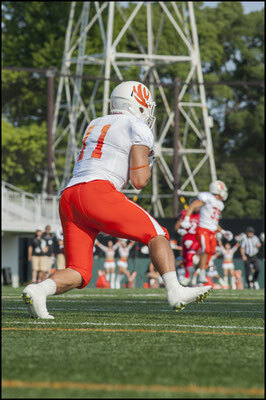 The two-time all-leaguer was Cameron’s go to target, gaining 88 yards on four catches. 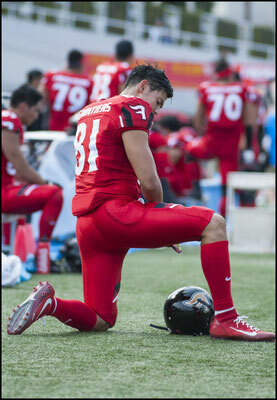 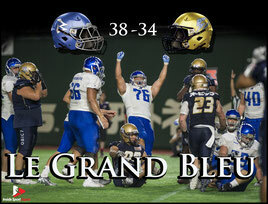 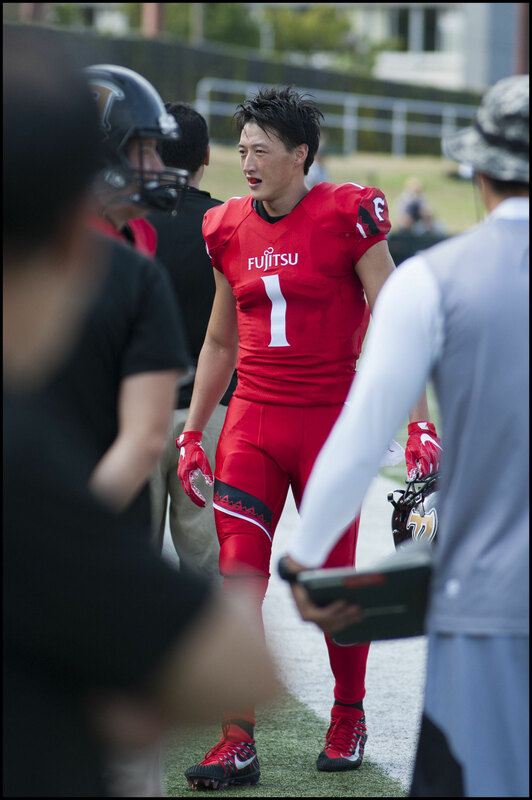 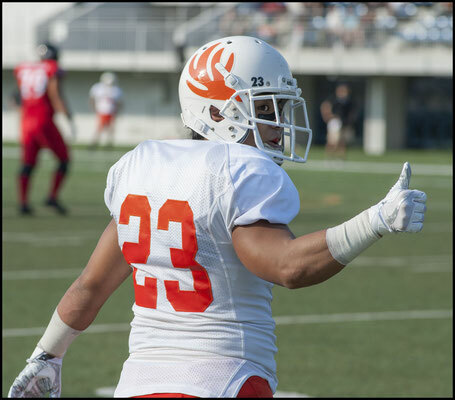 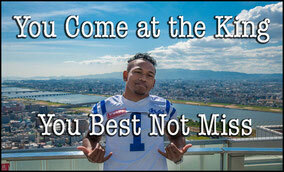 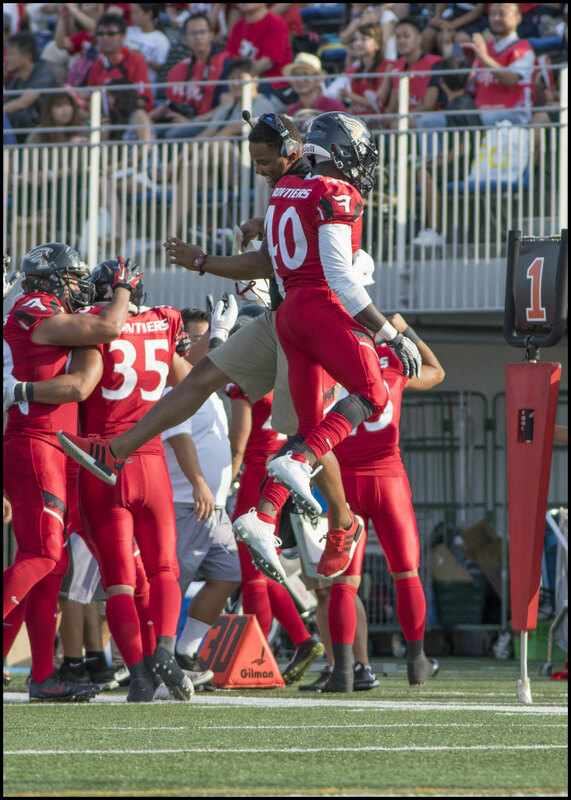 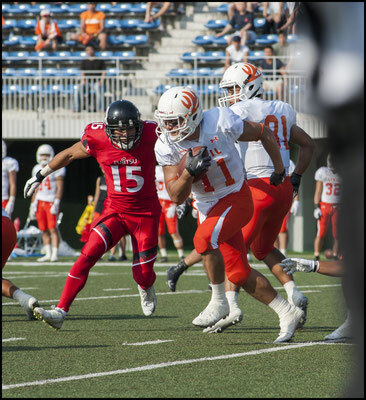 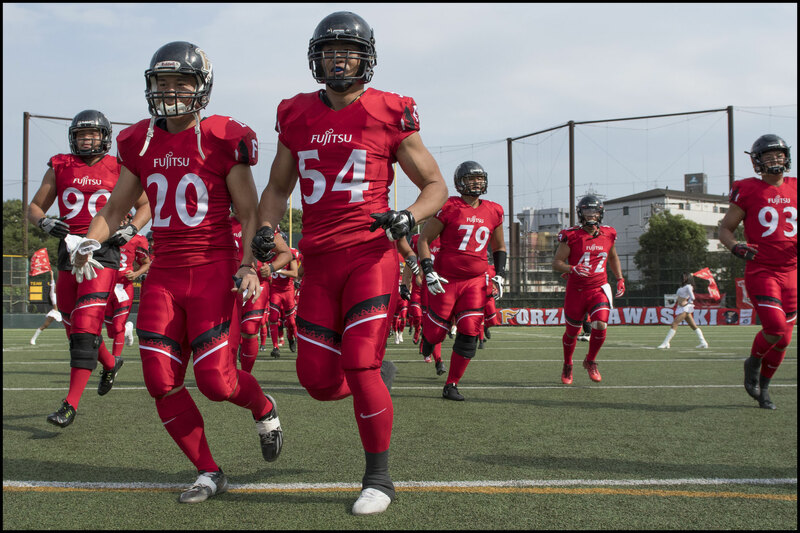 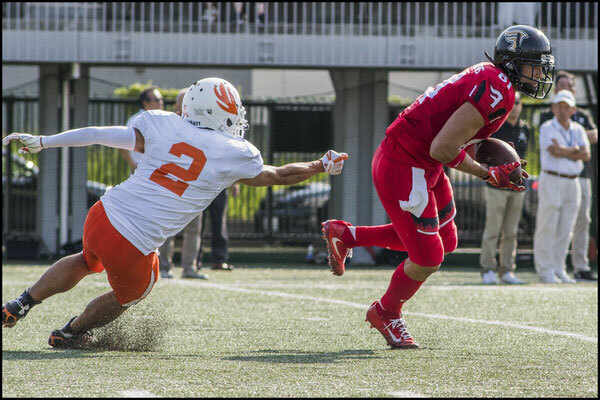 Both receiving touchdowns went to tight end, Yuji Mizuno, making a triumphant return after a year out. 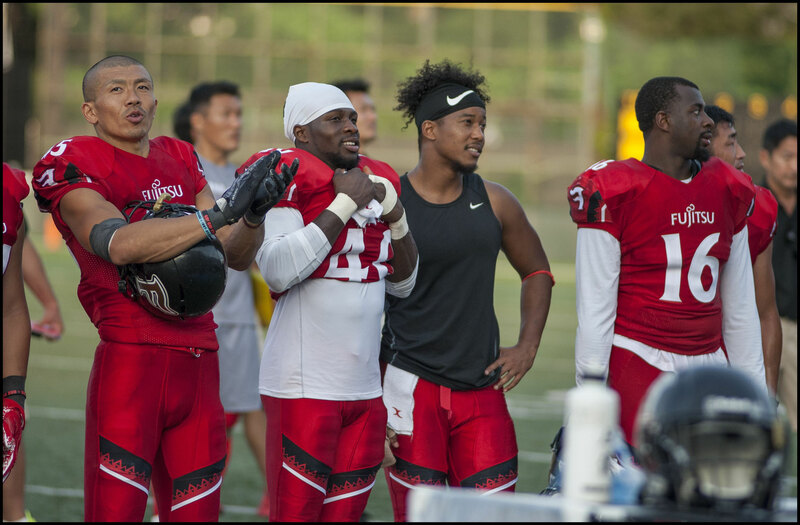 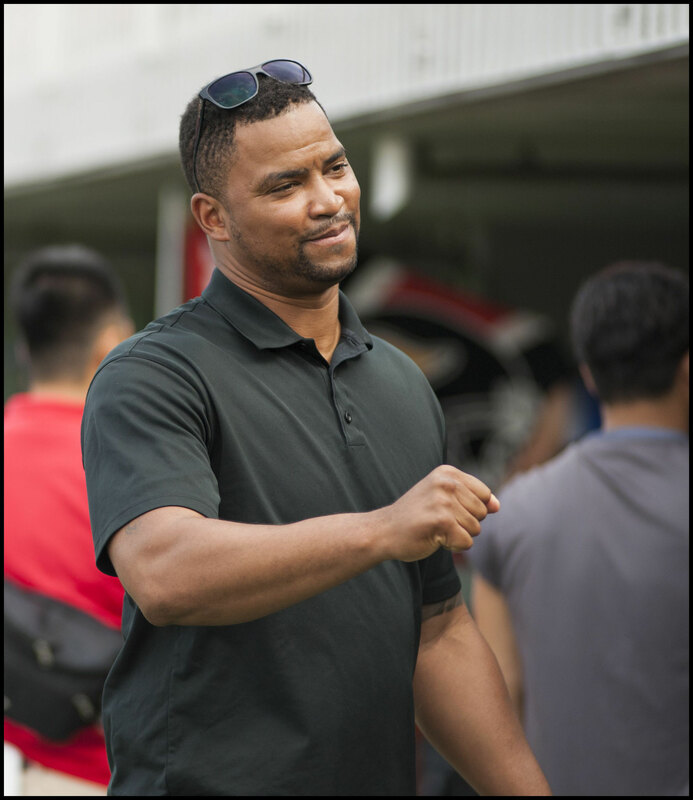 Cameron and others expressed their delight at having Mizuno back, and he was asked to give a speech to the crowd at the end of the game. 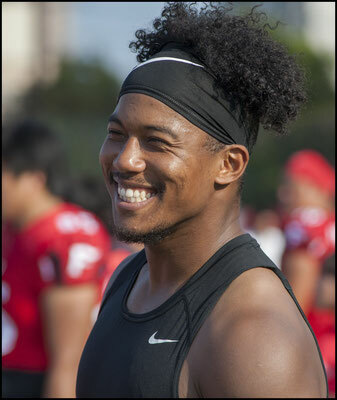 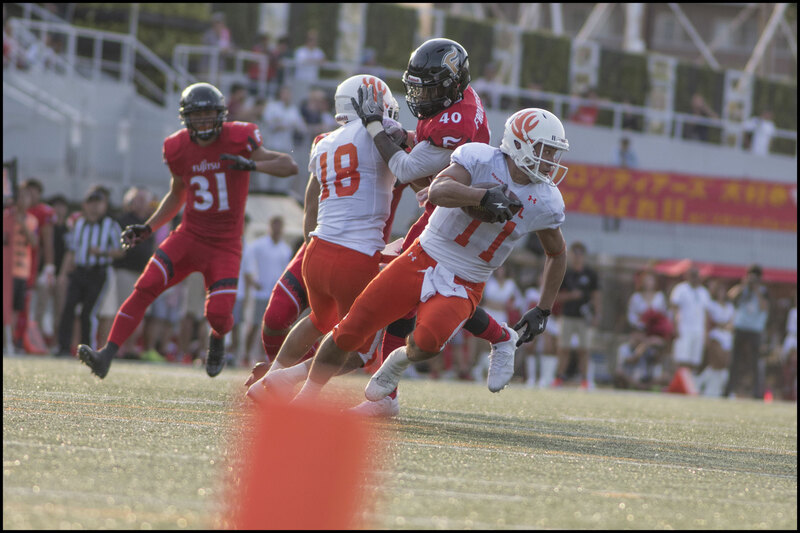 Fujitsu's ground game was also solid and RB Gino Gordon was a factor early in the game, averaging 6 yards per carry, with his longest run being 17 yards. 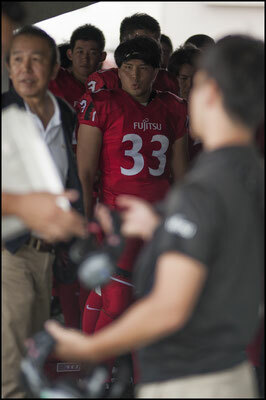 Gordon left the game before half time however, having injured his hand. 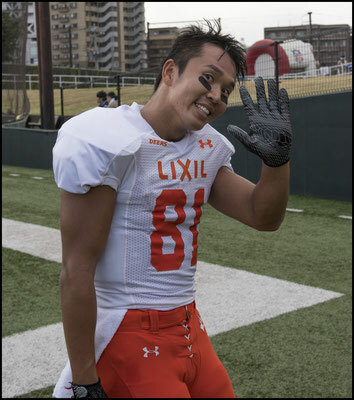 When interviewed later, he said that he jammed his fingers on a helmet, and the coaches decided to take him out of the game just to be on the safe side. 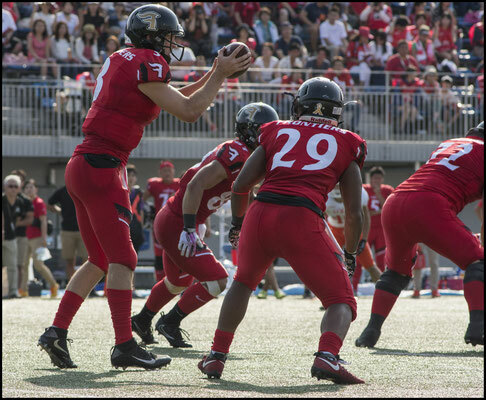 QB Cameron added 33 rushing yards, scrambling several times when he could find no receiver open. RB Keita Takanohashi, was the workhorse on the ground after Gordon was taken out, chalking up 62 yards in 12 plays. 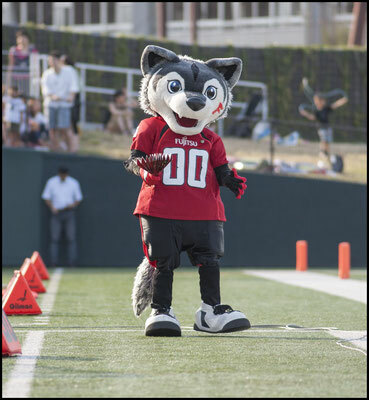 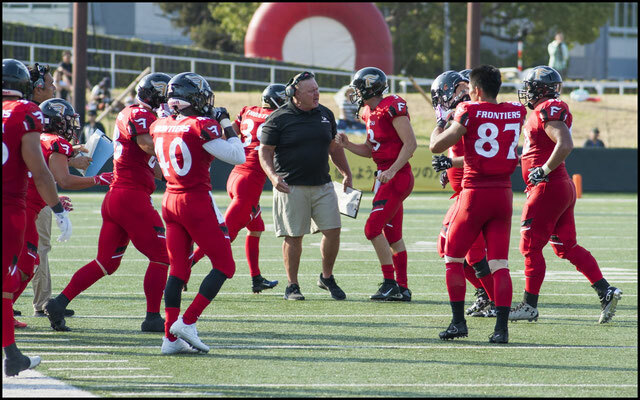 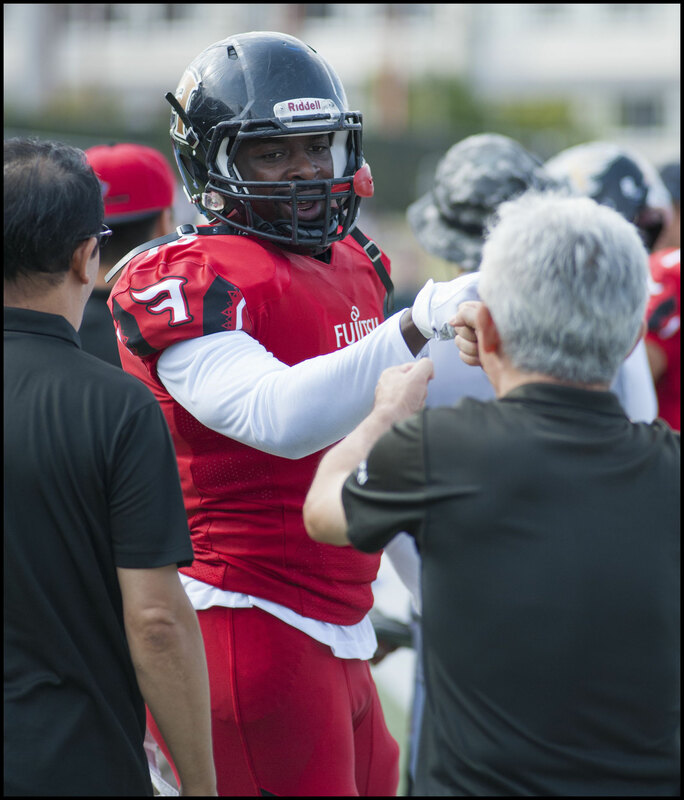 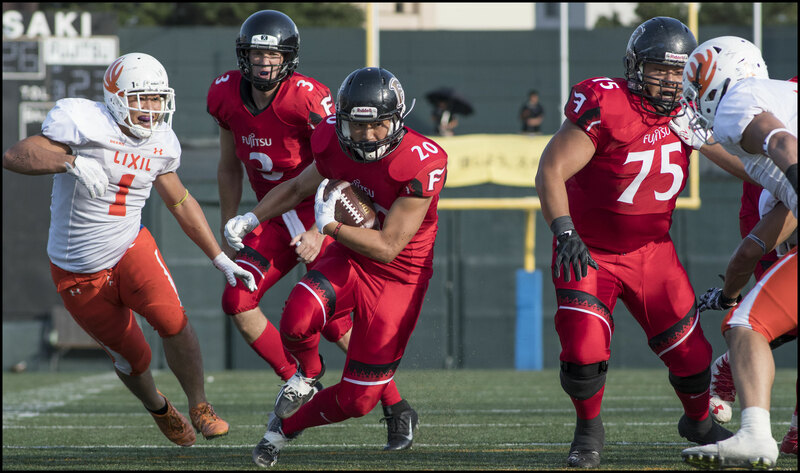 Many of those were in the 4th quarter when he was used almost exclusively after Fujitsu decided to rest Cameron and have backup QB Keiya Hiromoto repeatedly hand off to Takanohashi to wind down the clock. 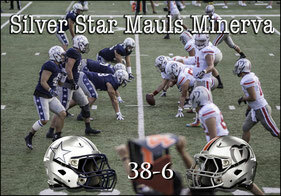 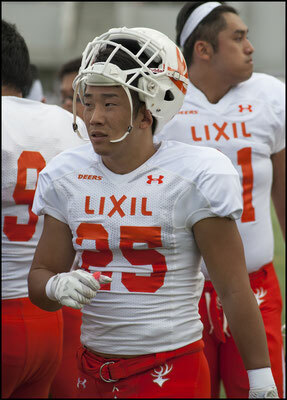 Things went south for the Lixil Deers early in the game, when on their second play from scrimmage, in what appeared to be a planned reverse, wideout Katsuya Nagakawa tried a shovel pass, that was never touched by the intended receiver, but picked up by LB Trashaun Nixon for an 18 yard TD return into the end zone with only 39 seconds off the clock. 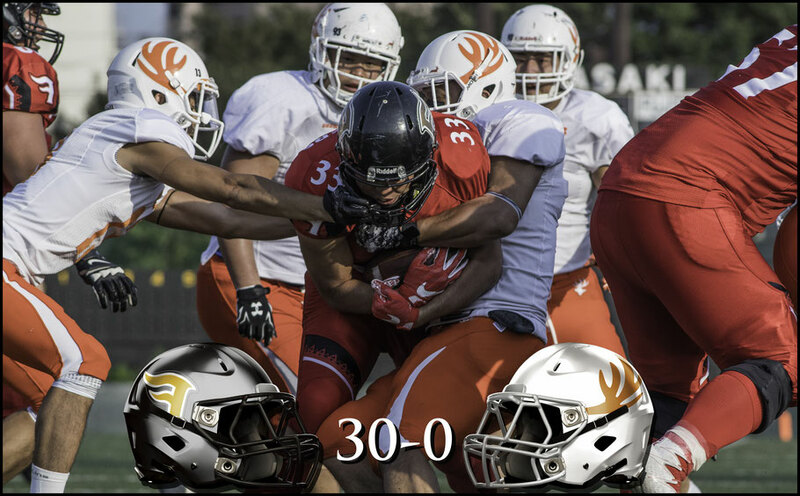 Nixon also recovered a Deers fumble for a TD in the 2016 Pearl Bowl. 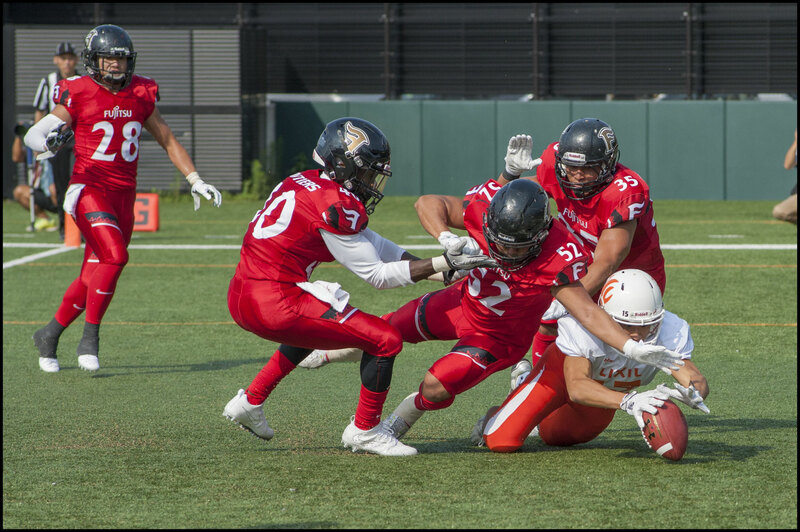 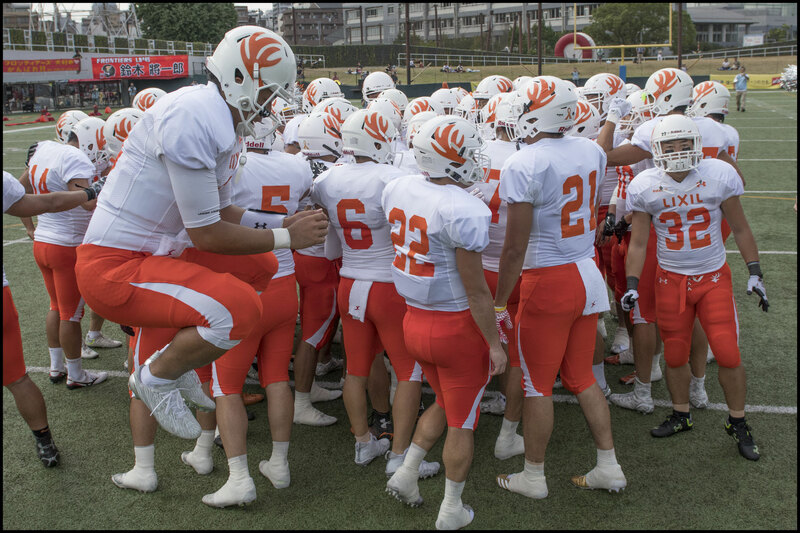 Lixil, of course are no strangers to coming back from poor starts but Sunday's game was a series of missed opportunities for the Chofu side. 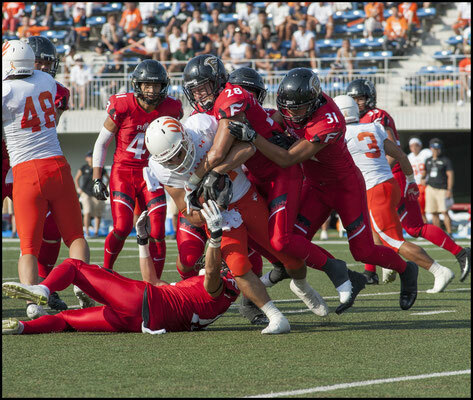 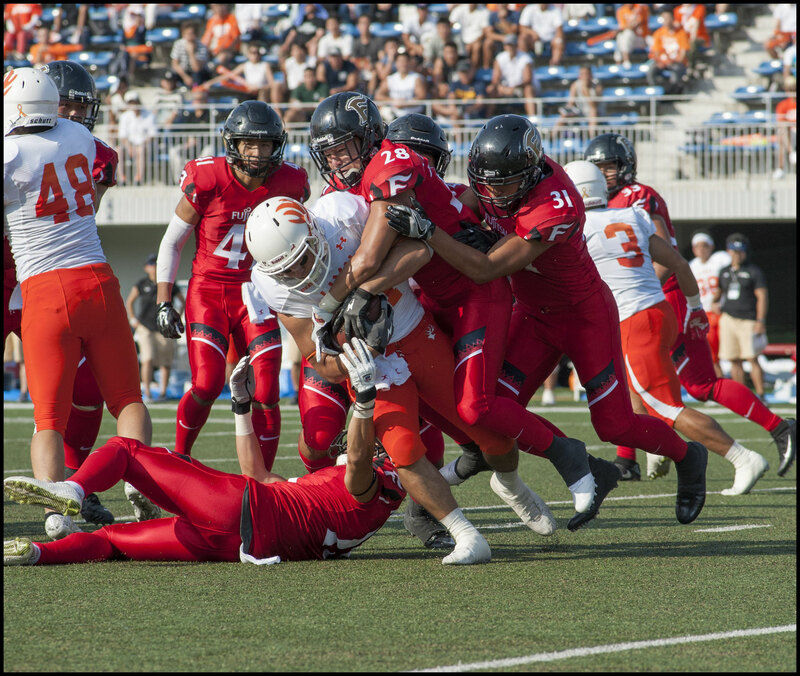 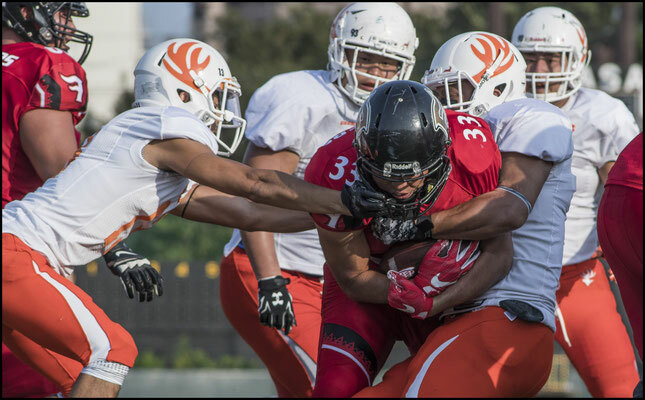 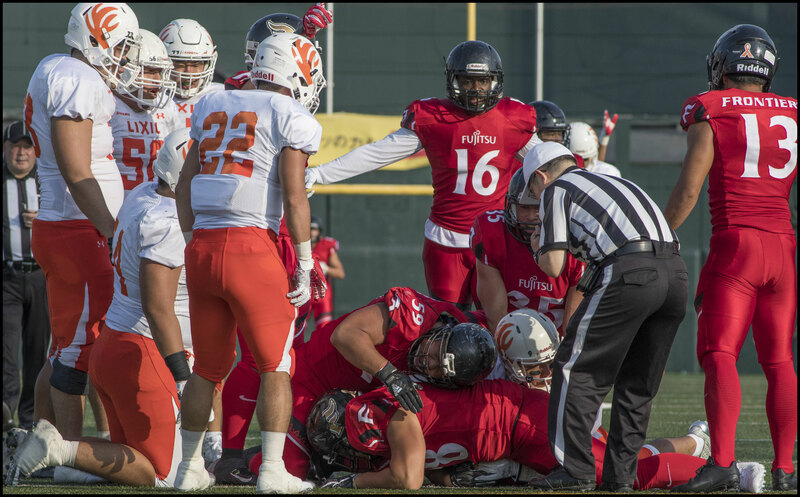 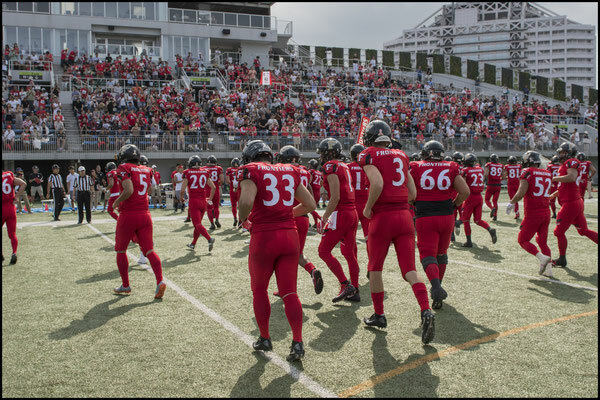 On their second drive, QB Kyohei Kato put together a consistent passing effort that took his team 75 yards in only 3 minutes, only to have what would have been a touchdown fumbled in the end zone for a touchback. 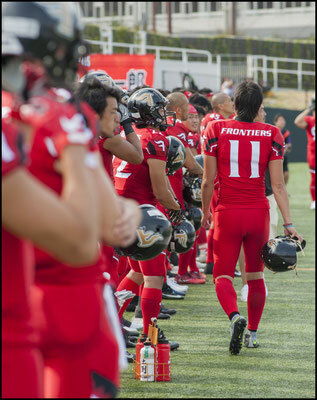 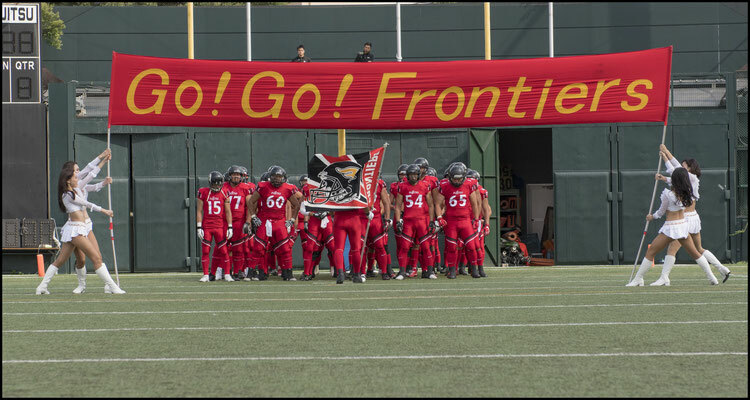 On their next outing, Lixil again found momentum, this time going 49 yards, before Kato got impatient and threw the first of two interceptions, straight into the hands of LB Akinobu Takasaki.Fujitsu turned that into three points at the foot of kicker Hidetetsu Nishimura, who was 3 for 3 on the night. In the second quarter Lixil caught a break when a roughing the kicker call gave them a fresh set of downs, but they failed to take advantage and ended up punting. 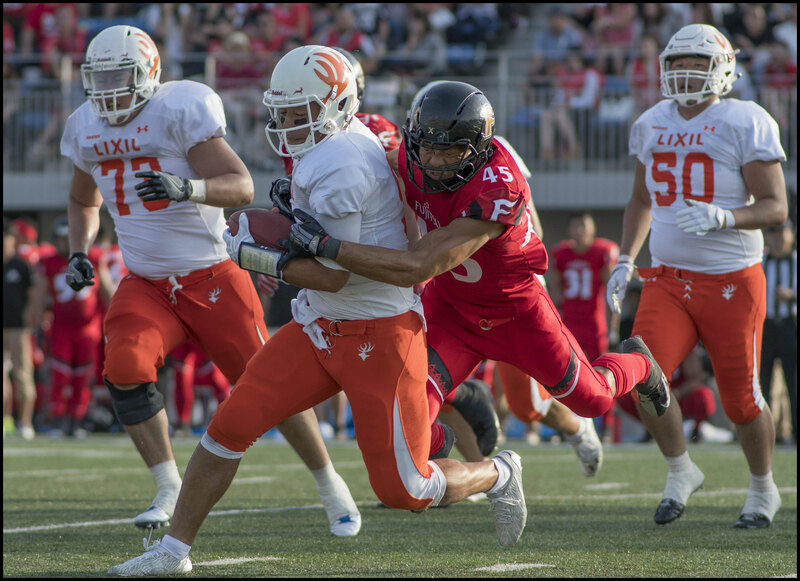 With a moribund ground game, Lixil mostly kept the ball in the air, and Kato was 24 of 36 for 228 yards which is impressive considering he was scrambling much of the time and was sacked four times. 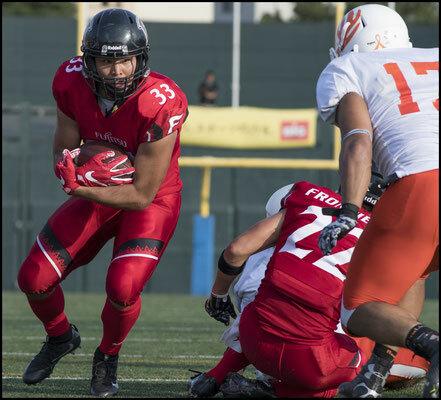 His main target, Katsuya Nakagawa had a respectable 76 yards receiving, followed by Yasuhiro Miyamoto and Satoshi Ishige at 59 and 51 yards respectively. The Frontiers next take on a Silver Star team that won on Saturday and expects to have three new Americans in its lineup. 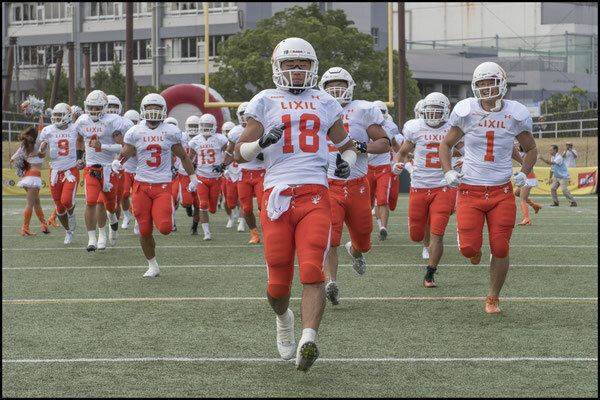 Lixil will have an easier task and should bounce back against the Metropolitan Police Eagles. 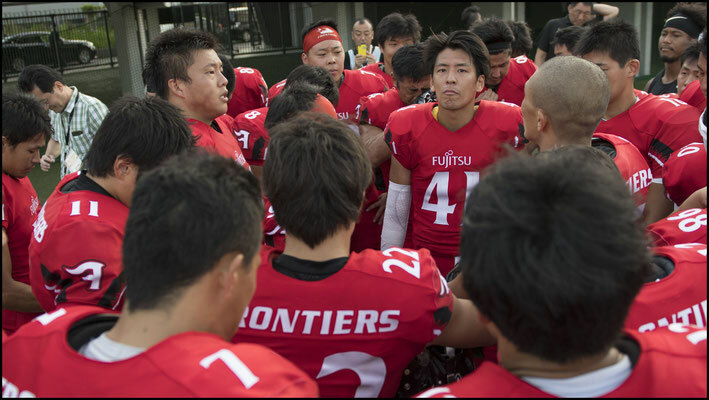 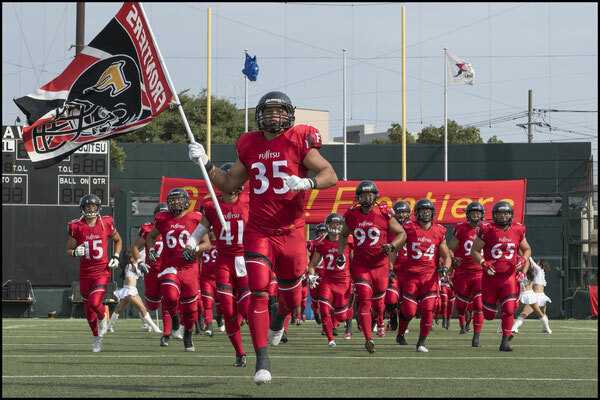 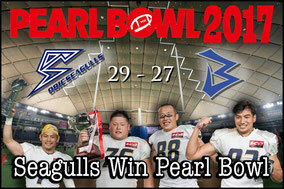 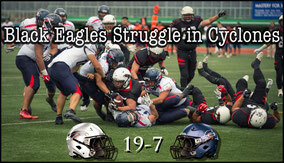 Both games are on Sunday September 10th at Fujitsu Stadium.